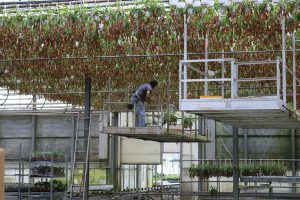 Deroose workers use an advanced scaffolding and lift system to access Nepenthes. Located off Rock Springs Road in Apopka, Deroose Plants produces ornamental plants for the green industry. Primarily a producer of young plants, their bread and butter crop is bromeliads, which are primarily grown for the South Florida and California markets, however they ship their products worldwide. Since starting their business in the United States in 1994, Deroose Plants has grown to a team of more than 120 employees and 15 acres of production space spanning over three locations in the Apopka area. Construction of the newest of the three greenhouses located on Rock Springs Road was completed in 2002. 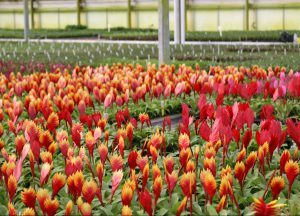 With the parent company located in Belgium, the decision to use a Dutch style greenhouse and system was made and the entire facility was shipped here in containers from Holland. Bromeliads, such as those pictured here, collect 80% of their nutritional and water needs through the cup found at the center of the plant. Deroose Plants has a unique water collection and storage system. The roof gutters are plumbed to a system of pipes so every time it rains, water is diverted and stored in a series of large silos at the back of the property. With a total capacity of 2 million gallons, this is the water used to irrigate the crops. Robotics is also used at Deroose Plants, both on the transplant line and to space and grade the finished plant post-production. The machines spare people from having to do some of the tedious, repetitive tasks and by grading the plants when they’re spaced, it results in a more uniform crop. In addition to being known for bromeliads and carnivorous plants, in today’s ever-changing horticultural market, Deroose has found success in a new venture – succulents. 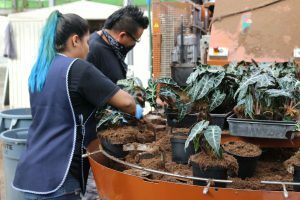 Deroose employees use a potting machine to pot Alocasia ‘Polly,’ which are commonly used in interiorscapes and sold as house plants. “Succulents have become so popular with consumers that it has grown into a large portion of what we do,” Berner said. The small starter plants are sourced from around the world, and a portion of them are started from tissue culture at their location in China. They are mainly grown in 2-inch pots and used to assemble a huge assortment of small retail-ready products. 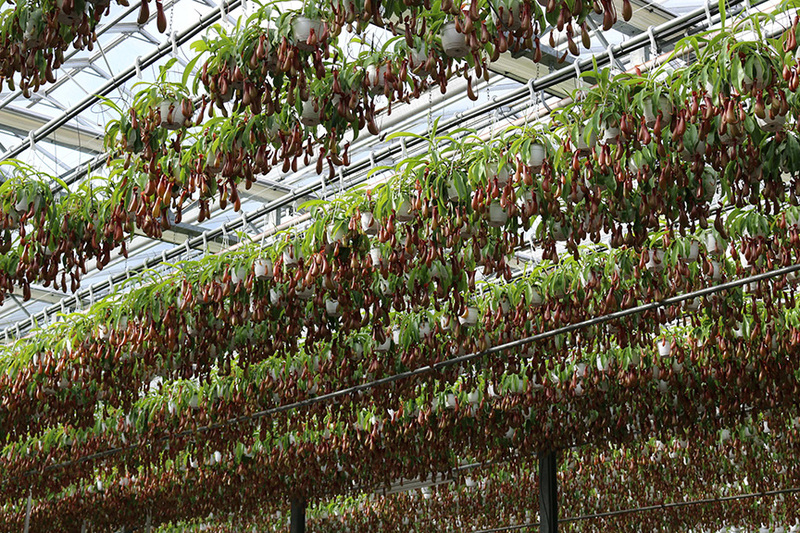 Nepenthes are most commonly sold as hanging baskets. 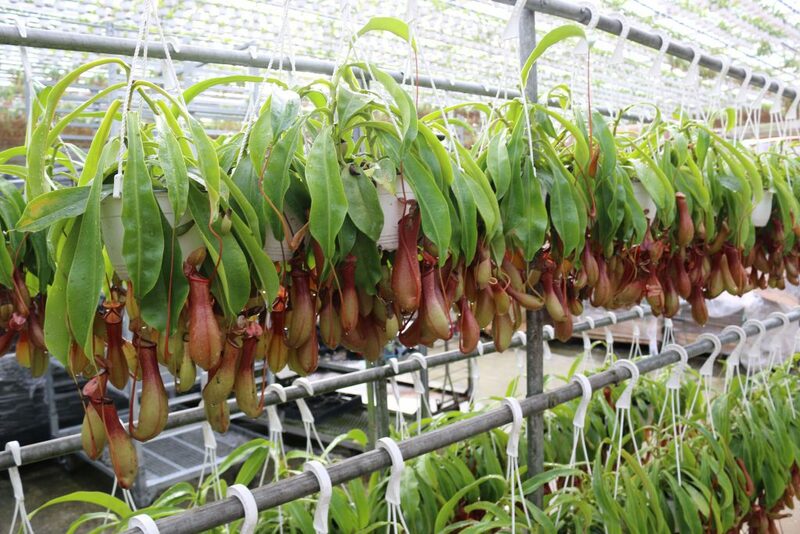 Nepenthes, native to the Philippines, thrive in Florida’s hot, tropical climate. Nice to see that the “advanced scaffolding and lift system” that I designed and fabricated in 2004 is still being used today. Simple and basic in design it rolls along the overhead heating pipes giving access to the plants from one end of the facility to the other across the full width.